How can I reuse or recycle pistachio shells? | How can I recycle this? Oh lovely pistachio nuts. How sweet and salty your squishy insides are. How tough and protective your hard outsides are. 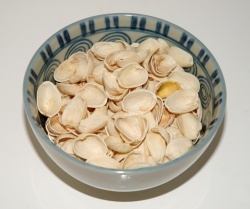 We’ve got a whole bowlful of the pistachio nut shells with no idea what to do with them. We’re reluctant to just throw them on the compost heap because it seems such a waste to just ask them to rot down again (and they’ll probably take ages anyway) but that’s a last resort I guess. Reuse – Practical: Use them at the bottom of plant pots to help drainage. Reuse – Creative: They can be made into rattles (in an old tin can or cardboard tube depending on how loud you want it) or instead of seashells wind chimes. 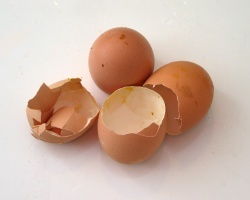 Recycle: Smash them up a bit and spread them around the garden – to start with, the sharp edges will deter slugs and snails and eventually the shells will break down into compost and feed your soil. decorate with them instead of sea shells. yeah, throw them in a wood burning stove or fireplace. they are high in oils that actually react with the creosote in the chimney and will cause it to flake off thus preventing chimney fires while heating your house. due to the oil, they give off a lot more than their weight in wood (celulose). If you put one in a paper clip and light it you will see ‘jets of fire’ branching out of where it is burning; this is the oil vaporizing and igniting when it comes in contact with oxygen. Pistachio shells are hard! Has anyone ever thought of grinding them down into a powder then reforming them with an adhesive to make an MDF type material? Pistachio shells prior to the preparation, namely a good rinse and dry. After you sort by size: large to large, small to small, medium to medium. With the help of a coffee saucer using its diameter, cut out a circle of very thick cardboard (in our case, we used the cardboard from a box). Outline the center circle and begin with an adhesive to form a flower from the small size of pistachios. 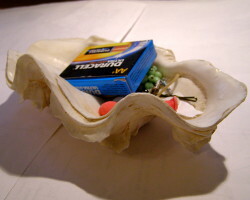 Getting glue with four shells in the center, then depending on the size of the shell. And as you can spread mosaic! My daughter uses crushed walnut shell substrate in her hermit crab’s tank. I wonder if crushed pistachio shells would work too?? Anyone ever use the shells as a potting medium for growing orchids instaead of fir bark. I would assume they have to be thoughly rinsed to remove and salt. Can’t you crush them down and make a poutice, for skin exfoliation? The edges would be to sharp and would tear your skin. If you like to cook out, use them on your grill or smoker instead of wood chips. It’s very good for smoking meat, better than hickory or mesquite! Make a wind chime out of them they sound pretty when they move around in your hand so why not out in the wind!!! Try a dremel drill with a dentist burr. I put them in a pot and boil them fora few hours and you get a paste that I mix in with my mashed potatoes it is rather tasty. Okay so you boil the shells for a few hours. Do the shells cook down and become soft? Soft enough to mash into the mashed potatoes? I am confused. Would you please tell me exactly how you do it? I buy and eat A LOT of pistachio nuts and I always have A LOT of left over shells. It would be so awesome to find a way to use them in my everyday cooking routine. Thank you very much for answering my question. Pistachio and walnut shells are often used as a abrasive in a sandblaster to remove paint from surfaces that would be harmed, eroded or scarred by sand or mineral based abrasive. Some vehicle or furniture renovators may be interested. Synchronicity! I was saving pistachio nut shells and kept going back and forth as to how to best use them. The first comment above answered my question. Thanks. I plan to bookmark this site! Thanks to all. I’m using them to refill a neck wrap/heating pad (heated in microwave) that my daughter made for her father. 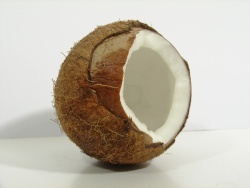 Originally it was filled with rice. I’ve seen cherry pits used for the same thing, so I why not pistachios. I scrapped out the center, then rinsed and dried them first. I did some research a while back on cherry pits. I’m not 100% about using in the way you are, but I know that they release arsenic. I wanted to add to my compost but that was said to be toxic. I know you can make liqueurs so I could be wrong in this instance. Just an fyi. I haven’t tried it yet, but I think they could be used to refill a bean bag chair. I plan to fill a small bag- maybe an ummatchable sock- and fill as many as it takes to refill the chair. the sock will keep them cushioned and will pad the edges. This will take a while, because, as much as I like pistachios, they are a seasonal treat. Has anyone else done something like this? I don’t like the idea of filling a beanbag chair with anything plastic or styrofoam. What else can they be filled with? Would you like to donate your shells? I can make a good use of them while teaching kids my inventive technique in using them in fine arts. Please let me know contact@efernandes.ca – Cheers and thank you in advance. i have some pistachio shells and i want to sell to turkey. I have seen very cute little nut people made using pistashio shells (body,head and maybe shoes) I just can’t remember how they were put to-gether,They sure were awful cute,Maybe 2 1/2 ” high. Anybody have the directions ?????? Just do a search for pistachio people pictures….I’ve seen many…. I am so sorry I did not see your offer in here. Do you still have the shells to donate for my artwork? It is greatly appreciate. my addy is: 310-1005 McKenzie Ave, Victoria BC, V8X 4A9 Canada. Are you still using pistachio shells in your artwork? I recently started eating a lot of the nut meat which is tasty and a great snack. Kept thinking the shells have to be useful for something. I find it hard to throw away anything that can be reused. Will be glad to send. I googled “used for pistachio shells” and found this group. Let me know. Take good care. Sometimes I capture june bugs which land on my porch and torture them for information as to where their hidden base is. Once they give me the information I want to know I tie them to a pistachio (pronounced: piss-ta-chee-oh) and then add a toothpick and piece of paper (triangle shape) to make a small boat. Next, I wait until it floods on my street and I send them on their way to freedom. BEWARE !! Aliens from distant galaxies often disguise themselves as June bugs in an effort to obtain intel to mount an invasion of Earth. I throw them onto my path in my fernery. They tend to keep down weeds. Nutshells make pretty good mulch and path spreaders and I put them into pot plants as mulch too. But don’t put sharp ones on your path unless you like a bit of pain. I am looking for pistachio shells donors. Can u donate the empty shells for me. I will use them to prepare a workshop for kids. I am a fine art painter for more than 13 years in Canada. I, 2 years ago, discovered that pistachio shells should be the substrate for my creative artwork. On average I use 800 shells to build a canvas. I invite you to visit my website, hoping you will love it. It is my thank you to Mother Nature for its unspeakable beauty. If you are looking to donating the shells I will appreciate your collaboration with my work. It the pistachio were salted, I wouldn’t use spread them around the garden,a s salt can hurt plants. Or at least, I would soak them in a bucket of water really thoroughly before using them. Same goes for putting them at the bottom of plant pots. use them to decorate a bird house. Then paint it or leave it as is. My understanding is that as they break down, the shells release acids, so they’re better for mulching plants that prefer that end of the pH scale, like roses and azaleas. Plan accordingly. where can i find the pistachio shell buyers ? but it is not always possible. Hopefully the sections above have contributed to your understanding of major bathroom remodeling. If you’d like to donate your pistachio nut shells in order to prevent throwing them out, I’d love to give them a good home, literally . I’d like to make pet houses, natural mosaics to teach my class about recyling, and cultural fun vests. please contact me @ naturegirlextreme@gmail.com to donate. Thank you. By sheer coincidence I found they make a good stuffing for a neck pillow- Sort of like buckwheat hulls if you are familiar with soba makura. You fill a one liter cylindrical plastic bottle (2 liters are too large) with shells, and then use them as a core for a neck pillow. I found that it provides just the right firmness. I imagine other hard granular organic shells or seeds would also work, but this I found out by accident while going through a bag and using an empty seltzer bottle to collect the shells. If you have enough of them, use them to fill potholes, and then run them over to crush them. This is called the New England way because people would do the same thing with clamshells.